Should I be Foam Rolling? “Should I be foam rolling?” “What does foam rolling do?” These are two super common questions we get not only from people who are new to working out, but also people who have been working out for decades. There is a cloud of mystery surrounding foam rolling, but here’s everything that you need to know about it. “Should I be foam rolling?” The answer to this question for most people is going to be “Probably.” Do you struggle to move through a full range of motion in a squat or lunge? Foam rolling your quads/hip flexors will probably be helpful. Are you a runner who is new to strength training? Foam rolling your adductors (the muscles of the inner thigh) will probably help your knees feel better. Feeling sore after your workouts? Foam rolling for a few minutes after you workout will probably make you feel a little bit better. Foam rolling isn’t the catch-all solution to every issue, but for a lot of people, a lot of the time, it is helpful. “What does foam rolling do?” Here is a simplified explanation of what foam rolling does. It gives you temporary access to an increased range of motion. Strength training in that temporarily increased range will help to make the temporary change more permanent. Foam rolling on its own will not increase your mobility. Foam rolling followed up with strengthening the muscles in the increased range of motion will help you improve your mobility. The temporary increase typically lasts from 5-10 minutes, so roll out the muscles you plan to use close to the time you use them. 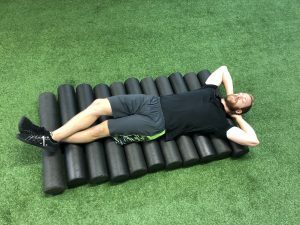 The science isn’t quite out yet on why foam rolling makes your muscles feel a little bit better after a workout, but we do know that a lot of people we train find they feel better when they roll out for a few minutes after lifting. Give it a try for yourself. Take a few minutes after your next workout and roll out your glutes, quads, and upper back and see if you feel a little bit better getting out of bed the next day. Keep an eye out for some upcoming posts on how to foam roll some commonly tight muscles!